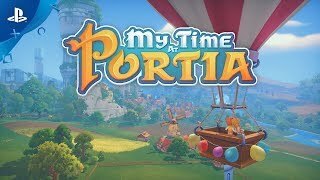 Start a new life in the enchanting town of Portia! Restore your Pa's neglected workshop to its former glory, grow crops, raise animals, befriend the town's quirky inhabitants and uncover the mysteries this charming post-apocalyptic land has forgotten! Become the Best Builder in the Land! 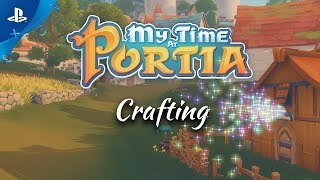 Armed with your Pa's workshop handbook and workbench, you must gather, mine and craft your way to being crowned the number-one workshop in the whole of Portia. Be prepared, though…it won't be easy! 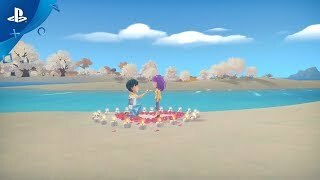 The town of Portia is full of unique characters for you to get to know. All going about their daily lives, be it going to school, doing their jobs, working out, or just having fun. Make lasting friendships, enjoy romantic dates star gazing, or embark on the adventure of marriage! Make your own mark on Portia and immerse yourself in this warm, welcoming town full of extraordinary experiences. Grow and nurture your own crops, keep livestock, and even ride some of your animals as you convert the empty woodland surrounding your home into a quaint, little farm! My Time at Portia offers an innovative approach to farming, allowing you to take advantage of planter boxes and semi-automatic irrigation systems. Make your house a home! Apply your personal touch with an exciting range of craftable furniture, decorations and room upgrades! Become a part of Portia's extraordinary community! Filled with a vibrant cast of unforgettable faces (all with exciting stories to share), energetic personalities and individual behaviors. Make sure you take the time to get to know them all -- who knows, maybe romance could be in the air? Delve deep into the ancient ruins and dungeons of Portia. Mine for resources and uncover what lurks beneath the seemingly peaceful land. It’s dangerous to go unprepared… Make sure you're equipped to face fearsome monsters and deadly bosses that stand between you and the secrets of Portia. Level up your character with a variety of skills to aid you in your adventures, in true RPG fashion! Portia is an enriching and vivid experience, jam-packed with activities for your enjoyment! How will you spend your time? Fancy trying your hand at cooking? You could challenge your new friends to Rock-Paper-Scissors, or for the more daring how about a little bit of sparring? Take your pick! There's also tonnes of mini-games, animal riding, and festivals to enjoy. Or maybe you just want to kick-back and spend the afternoon fishing? Its up to you how you spend your time at Portia! 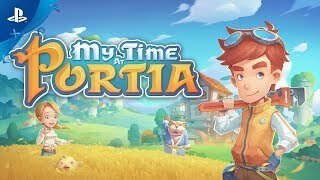 My Time at Portia. Developed by Pathea Games. © 2018. My Time at Portia and Pathea Games are trademarks or registered trademarks of Pathea Games. Published by Team17. © 2018. Team17 is a registered trademark of Team17 Digital Limited.